, the most celebrated of all the Greeks in the fabulous ages, was distinguished as a teacher of religion and philosophy, and his name became as illustrious among the Greeks, as that of Zoroaster among the Persians, of Buddas among the Indians, or of Thoth, or Hermes, among the Egyptians. But it has happened to Orpheus, as to many other wise men of antiquity, that spurious writings have been ascribed to him, and modern tenets have been obtruded upon the world under the sanction of his name. It has even been questioned, whether Orpheus ever existed. 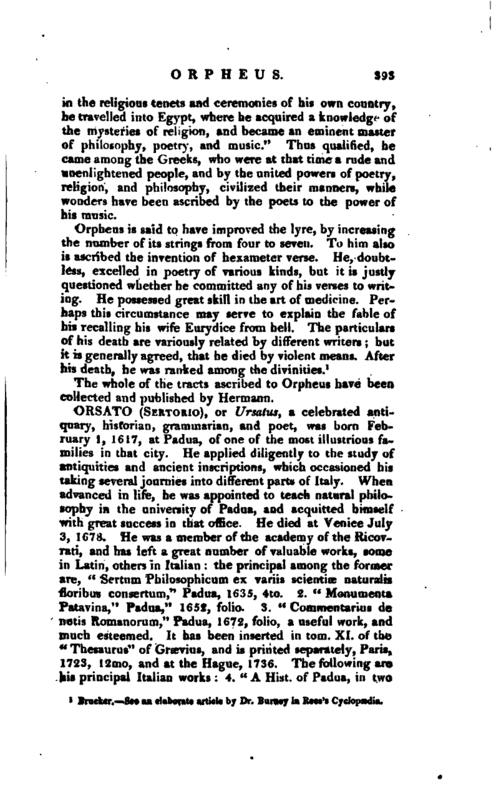 Cicero asserts, on the authority of Aristotle, that there was no such person as the poet Orpheus. 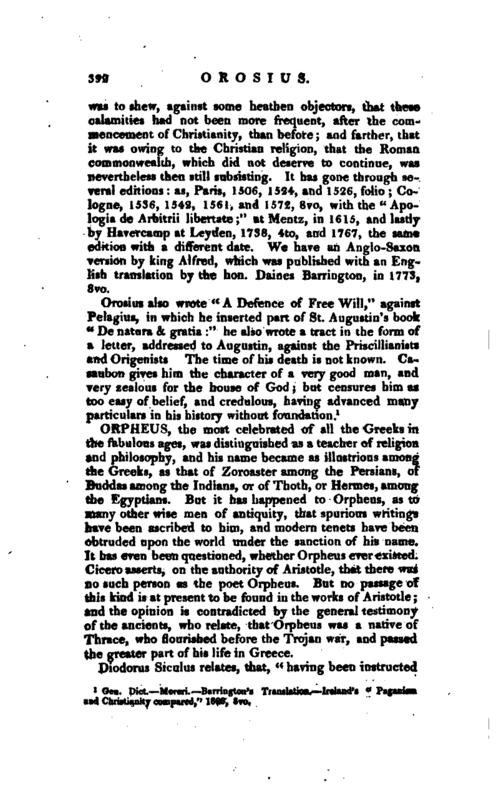 But no passage of tjiis kind is at present to be found in the works of Aristotle; and the opinion is contradicted by the general testimony of the ancients, who relate, that Orpheus was a native of Thrace, who flourished before the Trojan war, and passed the greater part of his life in Greece. Diodorus Siculus relates, that, “having been instructed | in the religious tenets and ceremonies of his own country $ he travelled into Egypt, where he acquired a knowledge of the mysteries of religion, and became an eminent master of philosophy, poetry, and music.” Thus qualified, he came among the Greeks, who were at that time a rude and unenlightened people, and by the united powers of poetry, religion, and philosophy, civilized their manners, while wonders have been ascribed by the poets to the power of his music. Brucker.—See an elaborate article by Dr. Buraey in Rees’s Cyclopedia. The whole of the tracts ascribed to Orpheus have been collected and published by Hermann.